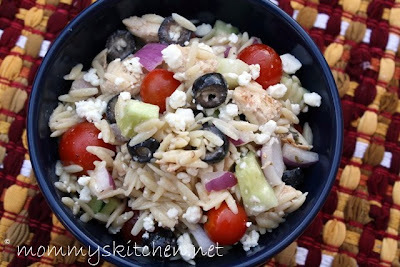 Today's recipe is for my new favorite salad, Greek Orzo Salad W/Grilled Chicken. I can't seem to get enough of it!! 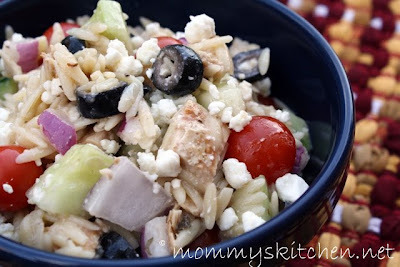 This tasty salad includes red onion, cherry tomatoes, black olives, cucumbers, feta cheese, orzo pasta and grilled chicken tossed in a zesty balsamic dressing. I got my first taste of this easy and yummy salad at my friends house. Ever since then I can't stop eating it. My daughter is even hooked which surprised me because I really thought she would turn her nose up to the Feta Cheese, but she said the cheese is the best part. Go figure!! Sometimes it's the things you think that your kids will dislike that they end up loving the most. This salad is a perfect side dish or a tasty summer meal. I like to grill up a few chicken breasts on the weekends and then store them in the refrigerator to use later in the week. It's such a great time saver having the chicken cooked ahead of time for this salad. If you're in a real pinch you can purchase Tyson's or John Soules fully cooked grilled chicken breast strips at the grocery store. This will totally cut out the cooking time and I been known to do that a time or two. At the beginning of summer I was able to use all the cherry tomatoes from our garden. I was so happy because they are quite pricey in the store. I'm sad to say that our garden isn't doing very well this year. It started out with such high hopes and then the scorching Texas heat burnt and dried out just about everything. I am so disappointed. It's such a bummer because the last couple years we have had such a great turn out. I miss all the zucchini, peppers, fresh beans and tomatoes. Were still getting a few green bell peppers here and there but nothing to get excited about. Our tomatillo's have come and gone as well, so really there isn't too much to be picked. I guess we can just start fresh again next year. 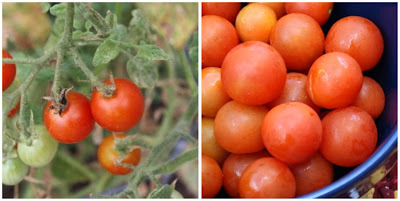 If you are lucky enough to have some cherry tomatoes in your garden this year, I highly recommend making this salad. It only requires a handful of ingredients and the dressing is a bottled balsamic vinaigrette dressing so it doesn't get much easier than that. All this talk about this salad really got me craving it, so I decided that is what I wanted for dinner tonight. tonight was pick your own meal night, so this salad was perfect for both Mackenzie and I. Here is a quick run down on how to prepare the yummy salad. The full recipe is at the end of this post. Bring a large pot of lightly salted water to a boil. Add the orzo pasta and cook for 8 to 10 minutes or until al dente. Drain and rinse pasta under cold water and set aside. 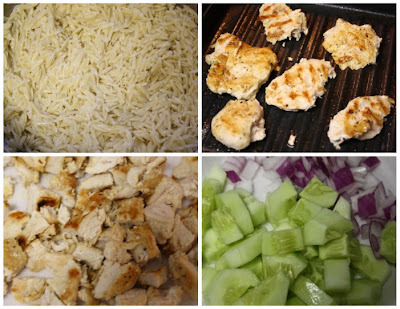 While the pasta is cooking season the chicken breasts with your favorite seasoning and grill. You can use a stove top grill or outside grill. When the chicken is cooked set aside to cool and then cut into bite size pieces. Dice the cucumbers not to small and chop of the onion. In large bowl combine pasta, cooked chicken, tomatoes, cucumbers, onion, olives and feta cheese mix well. Shake the balsamic vinaigrette to mix it and then pour over the entire salad. Toss to coat and chill for at least 1 hour. Bring a large pot of lightly salted water to a boil. Add orzo pasta and cook for 8 to 10 minutes or until al dente. Drain and rinse pasta under cold water and set aside. While the pasta is cooking season the chicken breast with your favorite seasoning and grill on a stove top grill or outside. When the chicken is cooked set aside to cool and then cut into bite size pieces. Dice or chunk up the cucumbers and chop the onion. In large bowl combine pasta, cooked chicken, tomatoes, cucumbers, onion, olives and feta cheese. Shake the balsamic vinaigrette to mix it together and then pour over the entire salad. Toss to coat and chill for at least 1 hour in refrigerator. Congratulations to the winners! Tina, I have extended an award to you, please do drop by when you can. See you! Have a good weekend! Oh, I eat this kind of salad all summer, I love it. I've never put orzo in it though. I"ll have to give it a try. That looks great! I love feta too. Have to try this one. Where do you find Orzo? I made this for dinner last night and it was delicious! I used a store cooked rotisserie chicken to save time since I don't care for the pre-cooked grilled chicken strips. There were even enough leftovers for my husband and I to take for lunch as well. Orzo is found in most Grocery stores in the dry pasta aisle in a small box or package. You may have to look hard for it.